NES Marble Madness (USA) in 02:50.55 by adelikat. 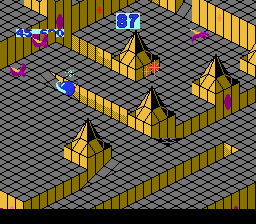 Marble Madness is a 3D'ish game similar in its style to Snake Rattle 'n Roll. The objective in these two games is quite different, though. In this game, the player must roll a marble from point A to point B. This is of course not as easy as it sounds. And certainly not as easy as it looks in this movie.